#SaveOrSplurge is a new DiscoverKL series highlighting the most luxurious makan spots, activities, places and travel spots in and out of KL. Leave it to our team to find out if you should just “save your money” or “splurge all the way”. For Valentine’s this year, Thirty8 @ Grand Hyatt Kuala Lumpur presents a 5-course meal prepared by its master chefs, Chef Salehin and Chef Rizauddin. Our team had the pleasure of dropping by to try it out to see if it’s really worth the price tag of RM680 per couple. 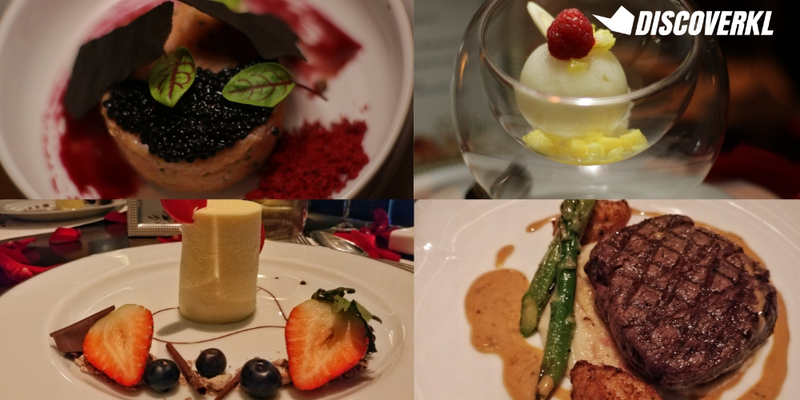 There’s a reason why Thirty8 is one of KL’s most well-loved fine dining experiences. Look outside the window and you’ll be rewarded with a view of KL’s more iconic infrastructures, what more from the vantage point of the thirty-eighth floor. 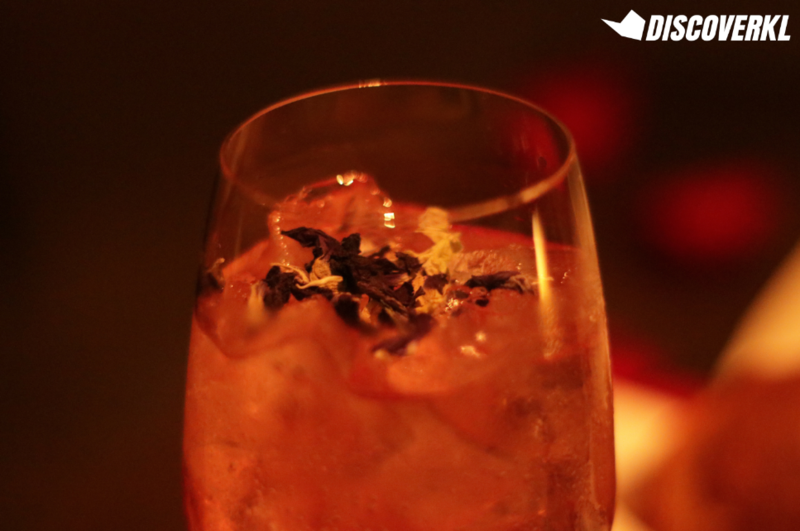 Upon arrival, you’ll be served with a rose fairy cocktail (definitely a refreshing twist to good ol’ rose) while you wait. The slightly fizzy drink is topped with butterfly pea flowers which we did not eat, but are completely edible. On a typical day, rose petals on your dining table is impractical and frankly, absurd. No one in their right mind does that. 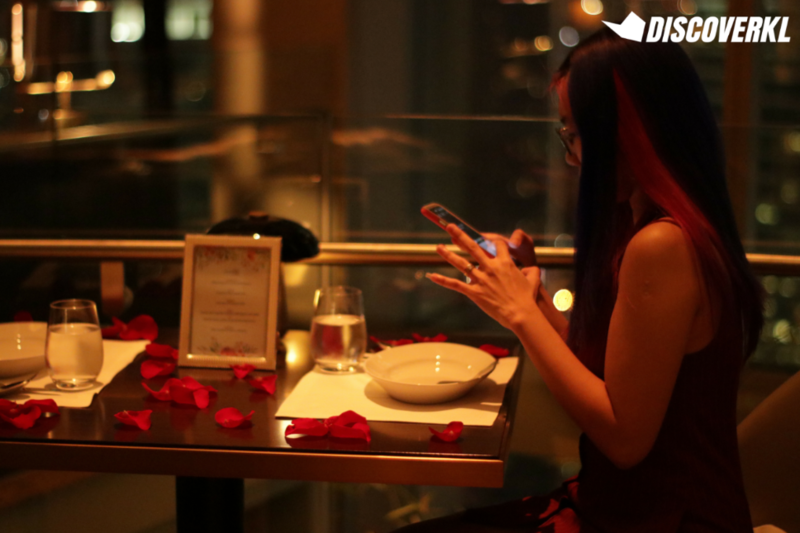 But admittedly, once in a while, it’s nice to dine with rose petals scattered in your line of sight as you dine with your loved one. 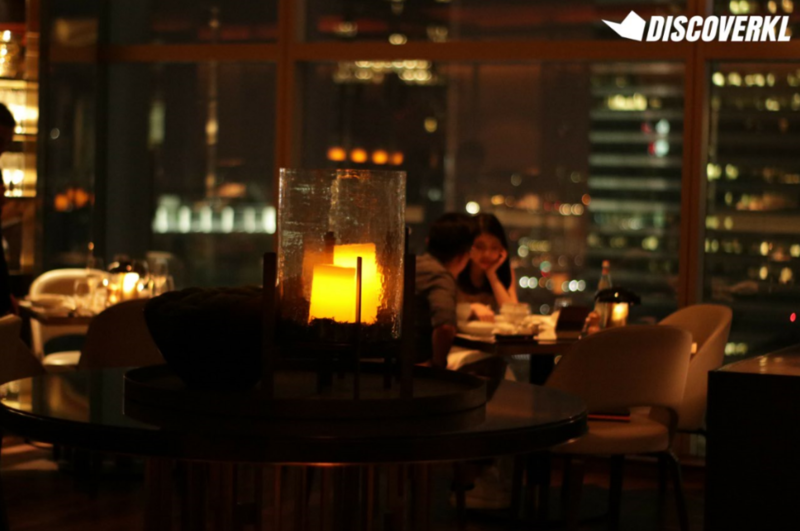 It’s little touches like these that help to set the mood for a romantic meal. Nothing irks me more than a stalk of leaf that you can’t eat or a garnish that merely garnishes but can’t be consumed. These are sadly, often times, observed in a fine dining experience. Fortunately, at Hyatt, there’s none of that. Everything on your plate serves a purpose to heighten your senses or simply because it’s delicious. One example of a meal with plenty of different elements (all of which are edible) is the appetiser we had. 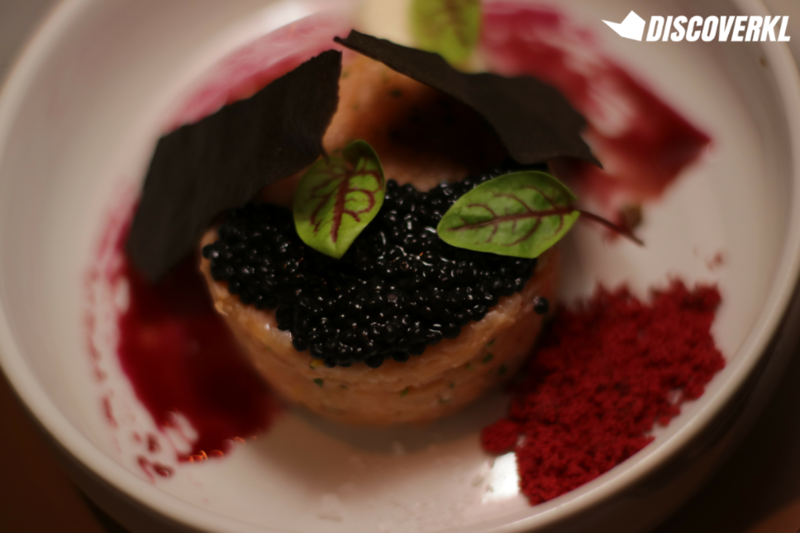 The dish is made of caviar, smoked salmon tartar, a sesame tuille and hibiscus. Chef Salehin shared with us that hibiscus is used as a side and also as the glaze. 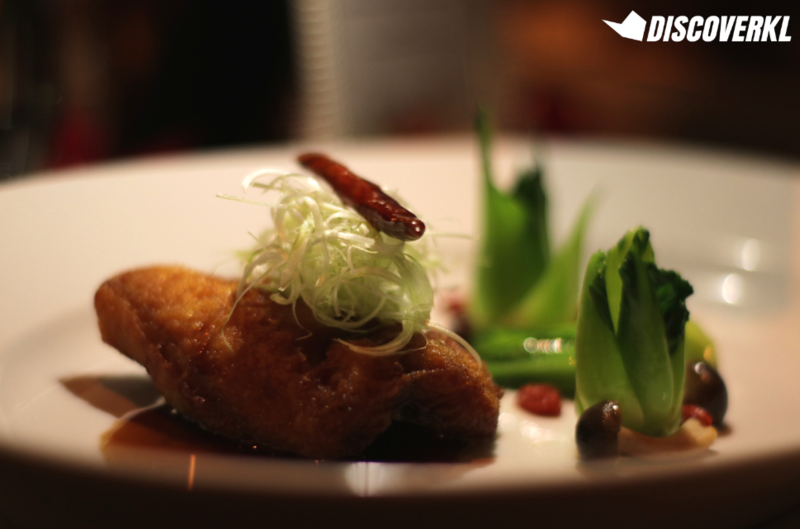 The dish comprises of sweet, savoury and sour elements. Hibiscus might sound like an odd ingredient but its purpose is to add a hint of sweetness to the dish as the smoked salmon tartar already contributes to the savoury element. 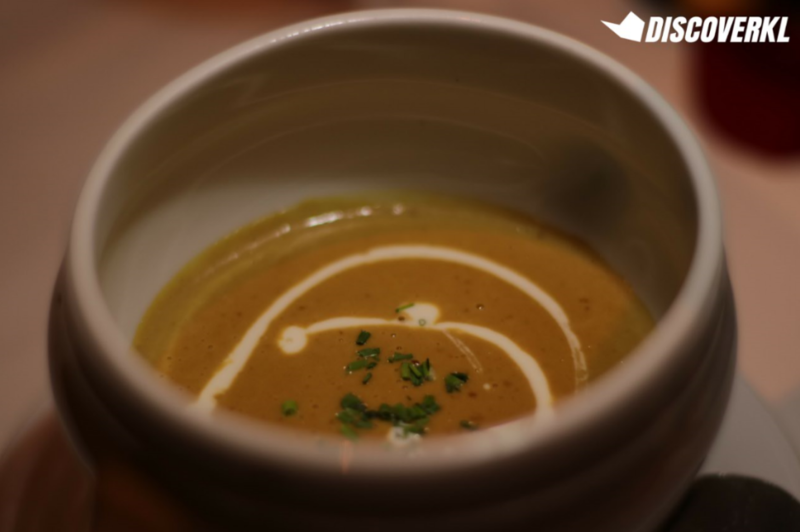 The seafood bisque is made of shell fish and made for an appetising dish prior to our main. Dictionary Time: A Bisque is a smooth, thick soup which is often times made with seafood. It’s got a nice thick consistency but does not fill you up quickly. We learnt that as Thirty8 is a halal restaurant, lemongrass is used in place of wine. The resulting flavour is one which is not too heavy. The mirepoix element in the dish has been slow boiled for 8 hours. Chef Salehin noted that if the team is preparing larger volumes, they will cook it for even longer. Dictionary Time: Mirepoix is a French style of cooking where diced vegetables are cooked, often times with butter, oil or fat, for a long time over low heat. There’s an intermission in your meal when the palate cleanser is served. After the rich bisque we just had, it’s nice to have something with a hint of sourness. It’s just a small portion but enough to whet your appetite for the main. Chef Rizauddin said that the dish has lemongrass and pineapple elements in it. “For this concept, I was inspired by how in every relationship, there are sweet and sour elements along the way.” We liked how he genuinely wanted to portray what love is all about in his dish, and frankly, he did quite a good job at that. Wok-Fried Alaskan Cod Fillet, Shimeji, Pak Choy, Kung Pao Sauce. We had the opportunity to try both. For the beef, we went with medium rare and as expected, it was tender. It’s actually quite the task to achieve a perfect medium rare. Anyone who has ever attempted this before would know. Slicing into the thick slab, you’ll find a nice pinkish, reddish tone. 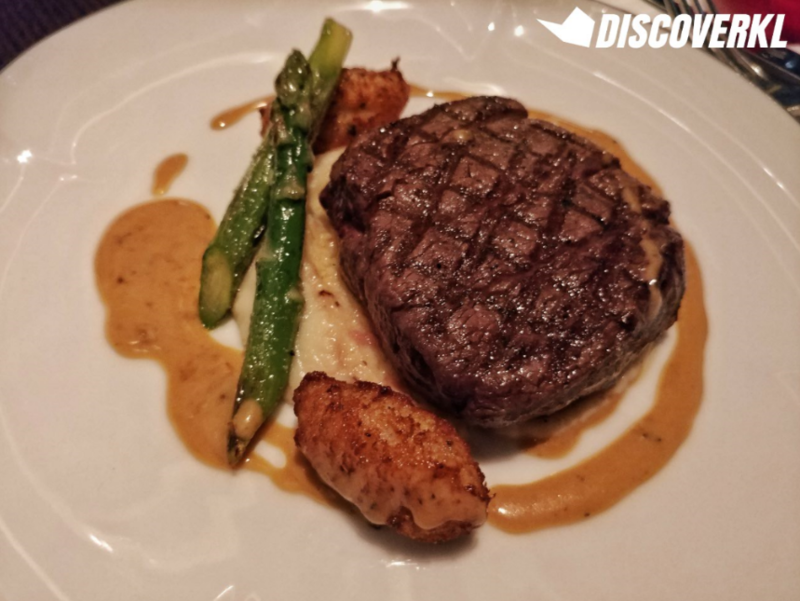 It’s not overly seasoned and the accompanying flavours help, so definitely have a little of everything on your fork, with each bite. The beef we had was accompanied by the buttery cloud-like truffle beignets. Dictionary Time: A Beignet is a type of deep-fried fritter or dough which can be consumed either sweet or savoury. The truffle beignet has a soft pillowy texture that’s pretty effortless. We wished there were more than 2 truffles in the dish because they were gone quicker than we liked. As for the onion soubise, the flavours aren’t too strong, which is a good thing because you won’t want the soubise to overpower the heavenly truffle beignet. Dictionary Time: A Soubise is a thick sauce made from onion puree. It’s usually poured over eggs or any form of protein as a sauce. The Alaskan Cod Fillet was an interesting addition to Thirty8’s Valentine’s menu. Where the majority of the meals we had were greatly influenced by French and Western styles of cooking, this dish is clearly very Oriental. It even comes with pak choy and kung pao sauce. Not that we’re complaining, as it was very well done. The fish has a nice crispy exterior, so much so that when we ran our fork across the skin, it gave us that satisfactory sound of a firm, crisp crust. 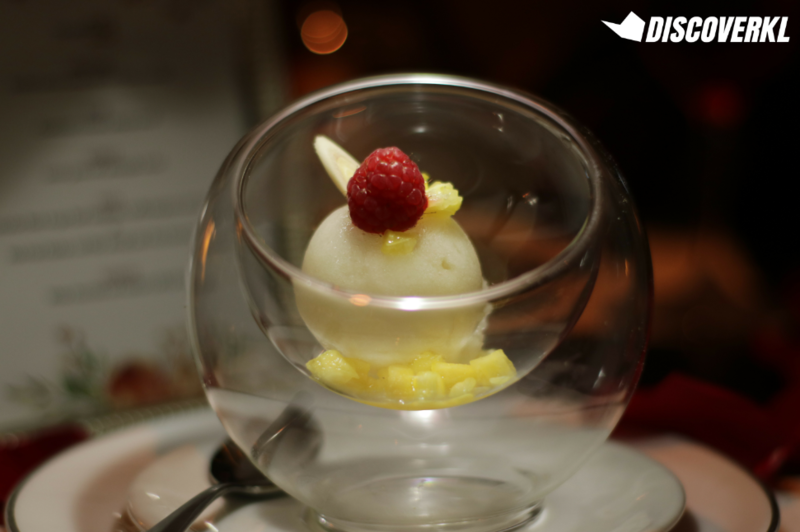 Chef Rizauddin shared that this dessert resembles a tower and signifies the pillar in a relationship. 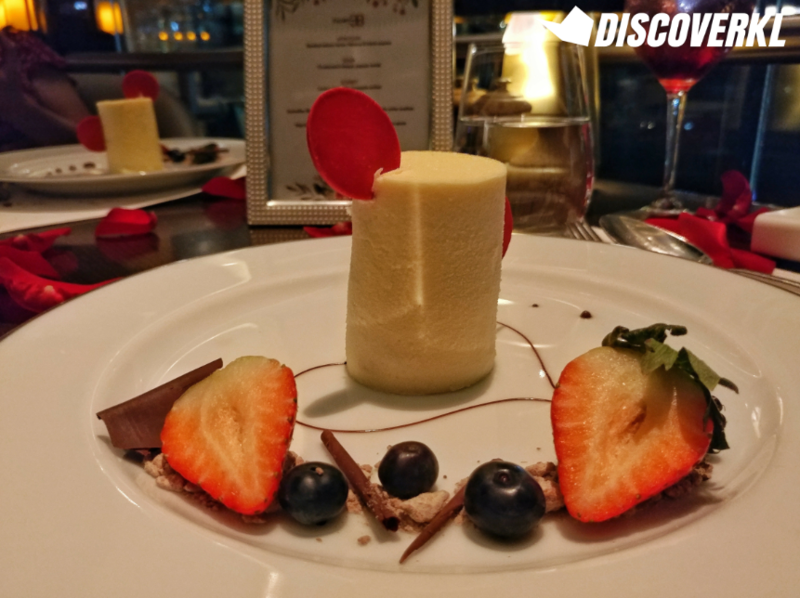 Where every relationship would ultimately go through patches of sweet and sour, it is represented in this white chocolate and raspberry dessert. The white chocolate exterior paired well with the tart raspberry jelly middle and because it is served with fresh berries, it’s very fresh and a nice end to our meal. College/Uni Students: Don’t even think about it. Considering how most college/university students are not earning a steady income, it would be hard to justify blowing more than RM600 off on a single meal. Worth considering in the future though. Young Working Adults: Worth trying at least once. The level of sophistication (both in the ingredients used and in the ambiance) justifies the price tag). After all, hibiscus powder and Black Angus Beef Tenderloins are not cheap ingredients to start off with. So, if you’re up for a gastronomical experience, give this a go. But be prepared to eat simpler meals in the coming month. Working Professionals: You’ve earned this (literally and figuratively speaking). Sure, realistically, even if you’re earning a five-figure salary, it can be painful to part ways with RM680 on a single meal. But it’s definitely a chance to experience the finer things in life. But be sure to limit such experiences to only once a month.